1. Begin by cutting a piece of Simply Creative Shabby Chic paper to fit the front of your gift bag. Ensure to leave a 2mm border before adhering your paper to the bag with Dovecraft Perma Fix tape. 2. Cut a coordinating sheet from the Simply Creative Shabby Chic 6x6 paper pad, ensuring to allow a 1cm border before sticking it to the centre of your gift bag. 3. Glue a white Dovecraft doily to the centre of your gift bag design. 4. Add strips of Dovecraft Perma Fix tap to the front of your Dovecraft chipboard frame and place it behind a complementing sheet of Shabby Chic paper. Ensure your paper design is facing upwards,and cut around the frame and the aperture with a craft knife. 5. Glue a coordinating piece of Shabby Chic paper to the back and cut off the excess around the frame. Adhere it to the centre of your bag. 6. Stick the words, ‘For You’ with the Simply Creative Cork Alphabet letters inside your frame. 7. Cut a thin strip of Shabby Chic paper and adhere it with Dovecraft Perma Fix tape to the bottom of your frame. 8. Die cut the flowers from the Dovecraft Flowers and Leaves die set onto a variety of patterned Shabby Chic paper designs. Adhere them to the top right and bottom left corners of your frame with glue and layer a few with 3D foam pads to add dimension. 9. Die cut the Dovecraft Heart Tag onto a coordinating piece of Shabby Chic paper. Embellish the tag with layered Dovecraft Flower die cuts using 3D foam pads. Glue the heart from the tag die cut on the centre of your layered flowers. 10. Thread a length of Dovecraft Serendipity ribbon through the tag and tie it to your gift bag. For a more neutral look, you could use the Simply Creative Azteca papers. Maxine has cut her chosen paper designs into triangles, adhered them to her gift bag and created little bunting flags for the handle! With our range of papercraft collections, you will never be stuck for gift wrapping options! 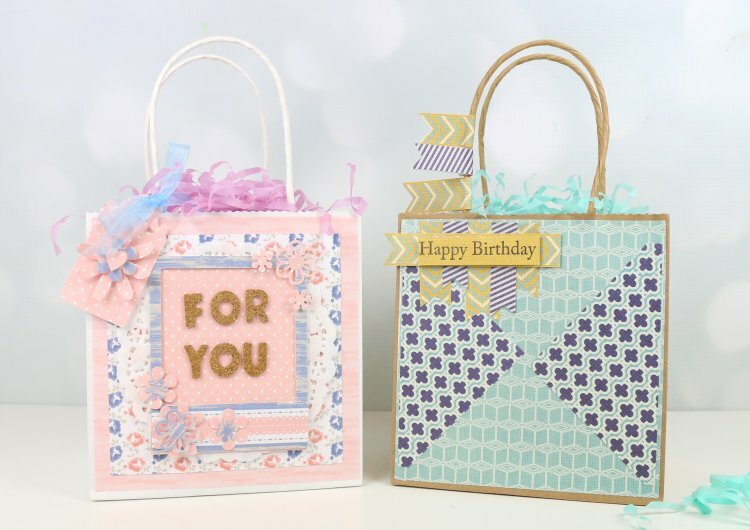 We would love to see your upcycled gift bags so don’t forget to upload them to the project gallery and to #trimcraft when uploading them to social media!